I love chinese food. When my mom went to university she worked in an authentic chinese restaurant. So as you can imagine when I was a little hobbit I was introduced to more exotic cuisine at a very early age…and thrived on it. This recipe is by no means “authentic” but it is tasty. For my mu shu wrappings I like to use rice paper. They keep in the cupboard forever, so you can always have them on hand, and they are much lower in calories than say a tortilla. I found that four of them totals 124 calories approximately. Your average tortilla can be anywhere from 50-100 calories for just one. Also I have heard tell that those rice papers are gluten free, no confirmation on that but happy news for any celiacs looking for fun foods to eat. The fun thing I find about Mu shu is how versatile it really is. Don’t have cabbage? Thats cool sub in another veggie or skip it. No pork? How about chicken or beef or even tofu instead? All of it makes for tasty moshu as long as you stick to the basic sauce and wrapper concept. Combine the ingredients for the sauce in a separate bowl. I usually start with the flour and build by slowly adding liquid to it to avoid lumps. Cut your meat into thin strips and coat with 2 tbl of white wine and 2 tsp of soy sauce. Heat your wok or skillet over medium high heat. Give that pan a spray of non stick cooking spray. Add the pork. Stirfry until cooked through, approximately 4-5 minutes. Transfer to a bowl. Add the garlic to the wok, stirfry until fragrant approximately 30 seconds. 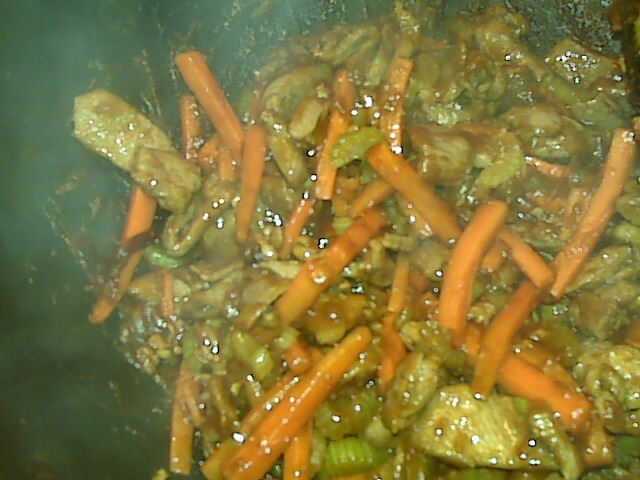 Add the shalots, stirfry another minute and then add the carrots and celery. Stirfry until slightly softened, approximately 3-4 minutes. Add the cabbage and a couple of tbl of water. Stirfry until the water has evaporated and the cabbage wilts. Add the pork and the sauce. Cook, stirring constantly until the sauce thickens. This usually only takes a minute. To prepare the rice paper I find all you have to do is douse it under some water for just a second and allow it to soften out of the water on your plate for about a minute. Then put your filling in, wrap it up, and enjoy! This recipe serves 4. With the rice wraps each serving is 334 calories. Sometimes we go hog wild on this and it will only serve two of us…we are very naughty about this recipe at times because it is just so tasty! That and 668 calories for dinner isn’t really all that bad when you work out earlier in the day. Sorry the picture is a bit cloudy…thats the steam. Mmmmm! This is great for those times you start craving some chinese take out. This entry was posted in Dinner and tagged Pork, Stirfry. Bookmark the permalink.